DIGMALL J205 Bluetooth Receiver, Instantly upgrade your wired stereos and car speakers to Smart. The mini wireless audio adapter will upgrade your non-Bluetooth audio systems to a new Bluetooth V4.1 level and provide a simple, easy to use solution for wireless streaming music. ■ Bluetooth v4.1 music receiver can provide higher quality and much clearer stereo sound than old Bluetooth v3.0/2.0 receiver. ■ EDR is short for 'Enhanced Data Rate', which ensures a faster data transmission rate and much more stable connection between a Bluetooth device and the Audio Receiver. Thanks to a handy dual connection method, with two devices capable of pairing together, both of you can either enjoy your favorite tunes. One slide switch to Power ON/OFF/ Fast Pairing and another face button to simply Play/Pause music. 16 Hours working time means you can enjoy music and calling for almost the entire day before next recharge. Your long road trips will never be boring. 1.J205 is only Bluetooth Receiver and can't pair to your Bluetooth Headphones. If you want to connect to your TV by pairing with Bluetooth Headphones, please search DIGMALL Transmitter. 2.J205 is not built-in Mic and can't support Hands-free calling. 3.J205 does not turn on automatically when your car is starting. You need to turn it on manually. 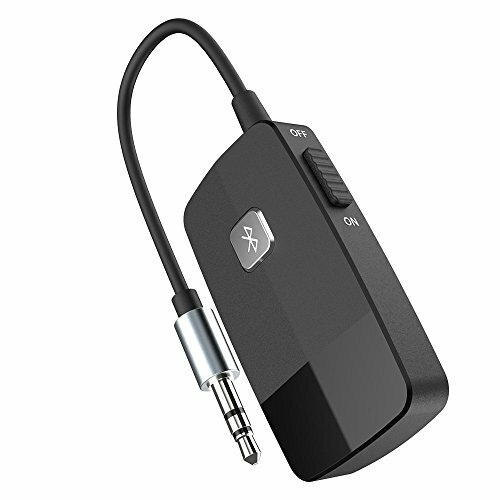 √【Premium Bluetooth V4.1 Adapter】: DIGMALL J205 compatible with most smartphones, ideal for home or vehicle audio systems. But please do not attempt to connect the gadget to such as Bluetooth headphones or Bluetooth speakers, this is totally meaningless since the gadget functions as a Bluetooth receiver for those devices Non- Bluetooth feature itself but desire to receive Bluetooth signal. √【Wireless High Definition Sound】: Powered CSR Advanced Bluetooth 4.1 and A2DP audio profiles so you can wirelessly stream crystal clear sound from up to 33 ft / 10 m away. √【Quick and Easily Paired】: Some Bluetooth adapters make you re-pair your devices every time. Not ours. Just switch on the Bluetooth function on your device and our smart adapter will be re-connected last paired device automatically, every time. √【Convenient Dual Connection】: J205 can be paired two smartphones together; feel free to either have the music on. √【Super Long Battery Life】: Delivers up to 16 hours of playing time and only needs 1.5 hours to charge up, via micro-USB. Comes with a 24-Month warranty & satisfaction guarantee. CE/FCC/ROHS certified.